Card Exchange Entry Edition brings you the easy four click interface that is available at a cost effective price and it includes the easy to use Step-by-Step configuration wizard! Never before has designing ID cards been so easy!Even if you run into any obstacles, Card Exchange offers a simple solution for you in the form of �Guru Peedy� (Powered by Microsoft Agent 2.0). This virtual character offers users a change to interact with their software and receive step by step guidance with any technical issues or questions they may encounter with the software. Entry also supports the standard Twain image acquiring,and can be extended with the Photo Exchange add-on to provide more extensive camera support. 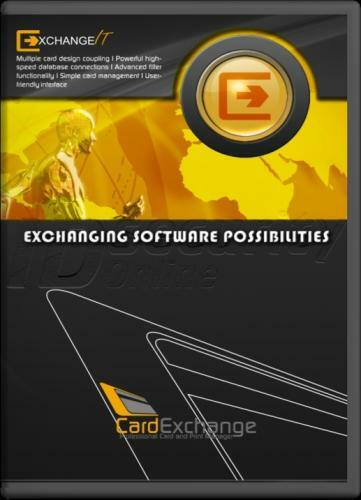 This add on allows users to access any Direct Show camera from inside their Card Exchange program. Photo Exchange enables users to see the subject they want to capture in real time making for steady and professional looking photographs. If you�re still unsure as to whether or not Card Exchange Entry is the right option for you, download a free trial directly from our website! This 42 day trial allows users to experience the full benefits of Card Exchange Entry without any risks. At the end of the trial, you can purchase the software or simply try another version until you find the right Card Exchange program for you.